Commission: Botany Town Centre, East Tamaki, Auckland. My brief for the foyer commission at Botany Town Centre was to create the illusion of a kauri forest without the trunks! The Forest Canopy concept is intensified with recording of indigenous bird calls playing in the space. A bronze spiral is placed below each missing trunk in the forest floor and is echoed overhead by a suspended aluminium spiral inserted within each trunk. Bronze castings of indigenous New Zealand fauna and flora are inlaid in the floor, to entertain children visiting the shopping complex. 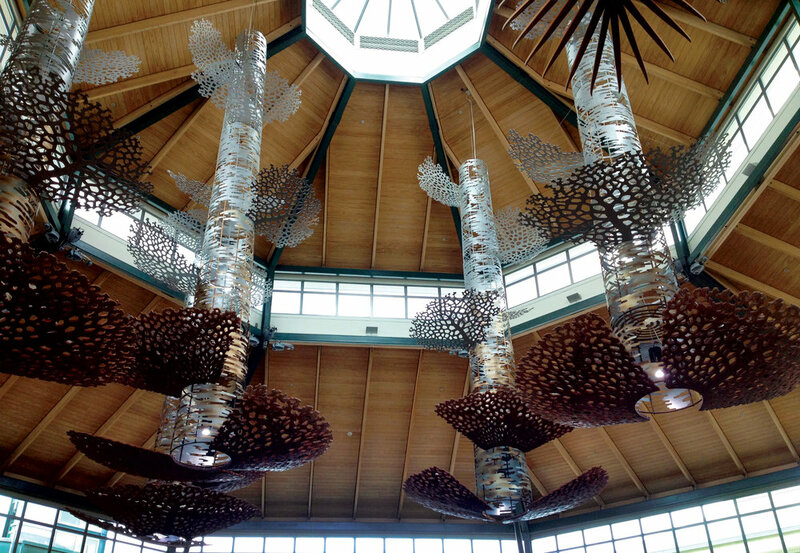 At the perimeter of the foyer, bronze castings of leaves from exotic trees, welcome new migrants. Dimensions: Kauri trunks: Heights variable 5000mm - 8000mm x Width 800mm tapering to 600mm. Frond: Length 2500mm. Canopy: Dimensions variable. 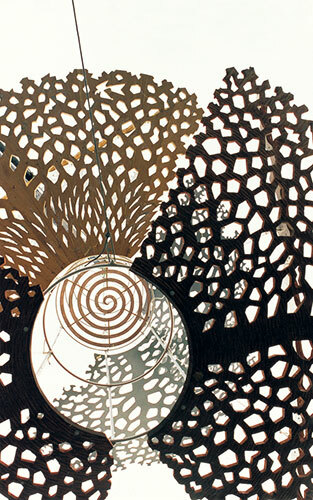 Materials: The canopy: laser cut, perforated aluminium, panels of stained and shaped macrocarpa and mirrors. The fronds: Hand carved macrocarpa. Bronze castings are inlaid in the Terrazite floor.